Paracetamol—also known as Panadol—is a widely used over-the-counter pain reliever (analgesic) and fever reducer (antipyretic). It is available in tablet, capsule, suspension, chewable tablet, effervescent granule and suppository forms. Paracetamol should be taken exactly as prescribed in order to reduce the risks of experiencing life-threatening side effects. The maximum dosage for adults is one gram per dose and up to four grams per day. Taking more Paracetamol than is recommended can result in acute liver failure and overdose. Patients should never take Panadol with other medications that may contain acetaminophen, including certain cold medications and prescription pain medications. Paracetamol is also a major ingredient in various drug combinations. It may be combined with a decongestant and used as a cold and flu medication. In combination with other painkillers, paracetamol can provide relief for more severe pain such as cancer and post-surgical pain. Take note, however, that most drug combinations are prescription drugs. Unlike aspirin and other NSAIDs, which are also effective analgesics, paracetamol does not reduce inflammation. However, it may provide relief for mild pain due to arthritic conditions. Paracetamol provides relief for many conditions that include headache, other body aches and pains, minor arthritic conditions, toothaches, fever, and colds. Although it provides relief for arthritis, it does not reduce the underlying inflammation and swelling of the affected areas. Your healthcare provider may prescribe paracetamol for other medical purposes not discussed in this medication guide. The exact mechanism of action of paracetamol is unclear. However, it is suggested that paracetamol works as a painkiller by elevating the person’s pain threshold (the lowest amount of stimulation at which pain is felt). More specifically, it affects certain chemicals in the body called prostaglandins. Prostaglandin is a substance released by the body during injury and illness and is responsible for pain experience. 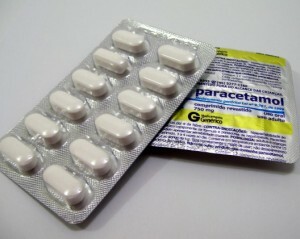 Paracetamol inhibits the production of this substance, making the body less aware of injury or pain. Paracetamol reduces fever by acting on the thermoregulatory center of the brain. Specifically, it commands the center to lower down the body’s temperature in case of fever. The onset of action is approximately 10-15 minutes after taking oral paracetamol and lasts for 1-4 hours. Paracetamol is available in many brands and drug formulations. Each product may contain different amount of paracetamol so be sure to read the specific dosing instructions. Read your prescription label or package insert carefully and take this drug exactly as prescribed. Do not take more than the recommended amount. If you do not understand the prescription or have questions, consult your healthcare provider. Oral paracetamol is taken by mouth with or without meals. If taking oral liquid formulations, use the specific dose-measuring device (dropper, spoon or syringe) that comes with the medication. Do not use household spoon or teaspoon. If taking suspensions, shake the bottle first before each dose. If taking rapidly-dissolving tablets, allow the tablet to dissolve first in the mouth before swallowing, with or without water. Chewable tablets should be thoroughly chewed before swallowed. Extended-release tablets must be swallowed whole. Do not split, crush or chew the tablet. If taking effervescent tablets, dissolve the tablet in the recommended amount of water before drinking. Inform your healthcare provider if you have allergy to paracetamol, or if you have any known allergies. Tell your healthcare provider about your medical history, especially liver impairment or history of alcoholism. Paracetamol can cause liver damage. Drinking alcohol daily, especially with paracetamol, can increase the risk of liver damage. Therefore, alcohol should be avoided while taking paracetamol. If you consume more than 3 alcoholic beverages daily or if you have alcoholic liver disease, consult your healthcare provider before taking this drug. Paracetamol may not be safe for you. Chewable tablets, dissolving/effervescent tablets, and oral liquid products may contain aspartame or sugar. Caution should be taken if you have diabetes, phenylketonuria (PKU), or other medical conditions that require limiting/avoiding these substances. Tell your doctor if you have any of these conditions. Pain medications are best taken as soon as pain is felt. If you wait for the pain experience to worsen, the medication may not be as effective. Do not take this drug for fever more than 3 days unless specifically instructed by your healthcare provider. For adults, paracetamol should not be taken for pain lasting more than 10 days. Discuss with your doctor other symptoms. If symptoms persist or worsen, consult your healthcare provider. If you suspect a serious medical problem, seek medical attention immediately.